The ever present problem for small agencies is understanding who is working on what, what needs to be done, and how much time is being invested in various projects. Gauge is no different in this need to create clarity in tasks and projects. The solution was three parted. First, our agency ditched time tracking altogether. No one likes doing it and we found it was often inaccurate. Second, we adopted a pseudo-agile methodology for running projects. We adopted task points for tasks, sprints, sprint planning for projects, and retrospective meetings. Thirdly, we decided to build a custom task dashboard on top of our project management tool. We decided to build this dashboard to show us how teams and individuals were moving through tasks and projects this way we could scope and plan projects more accurately. Our agency moved quickly through the first iteration of the dashboard to make sure it would work and was a feasible solution. Then, I worked with our PM, D.J., and developer, Carlos, to refine the look, functionality, and flow of the software. 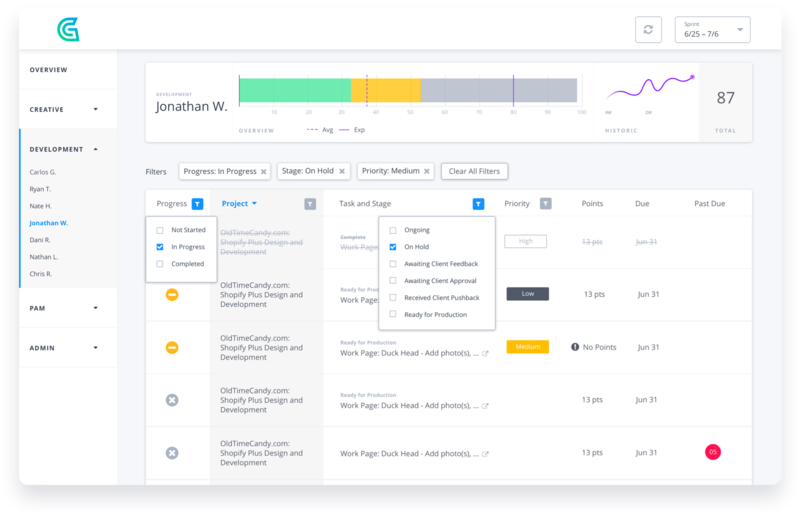 While everyone in our agency will use the dashboard at one time or another, we designed the software for the project and account management team to understand who is working on what. They became our primary users while our production team became our secondary users. Inherently, the two sets of users would have conflicting needs and wants so we focused on building first for the project and account Management teams. This included focusing on flows that would cater to getting overviews of projects as well as team overviews. Since many of the pages highlight dense information and data, we needed something that would be legible at small sizes and large sizes alike. I chose Open Sans so that legibility and funcionality were at the core of the product. While data is at the core of the software, what do with that data is more of a concern. Insights and actions about data are far more important than what the data is. 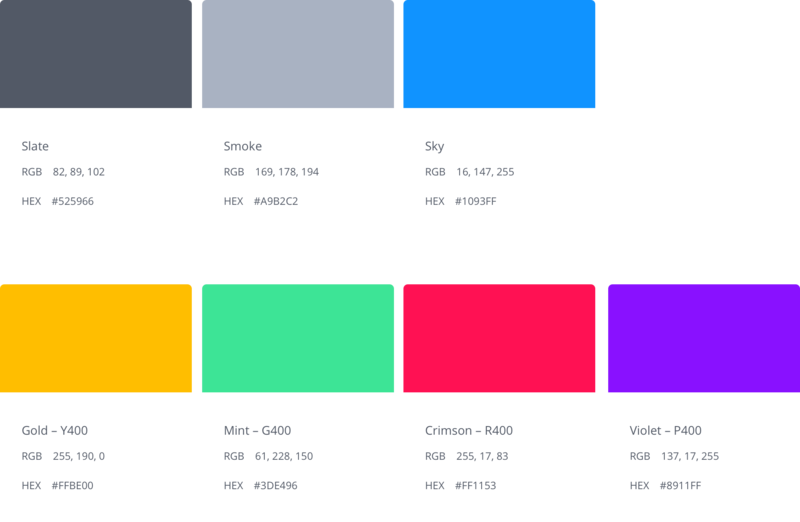 Thus, I chose colors that would remain neutral and in the background until information on screen required action.Blue, green, and yellow became the "default" color pallette for the interface while red and purple brought attention to actions or data that was out of the ordinary. The basic flow for the software is to allow PMs and AMs to access teams and individual team members. Additionally, they need to view information about what is in progress and how far along it is. We designed the individual dashboard to give a PM or AM a high level overview of all tasks that are on that individual's plate. This way said PM or AM can quickly decide where to put that individual's time and energy. Additionally, the dashboard shows anything that may not be moving fast enough or that may be overdue. This additional functionality gives the PM or AM the information they need to talk to the team member and find out what is going on. This way fewer tasks fall through the cracks, projects get completed faster or on time, and clients are happier. 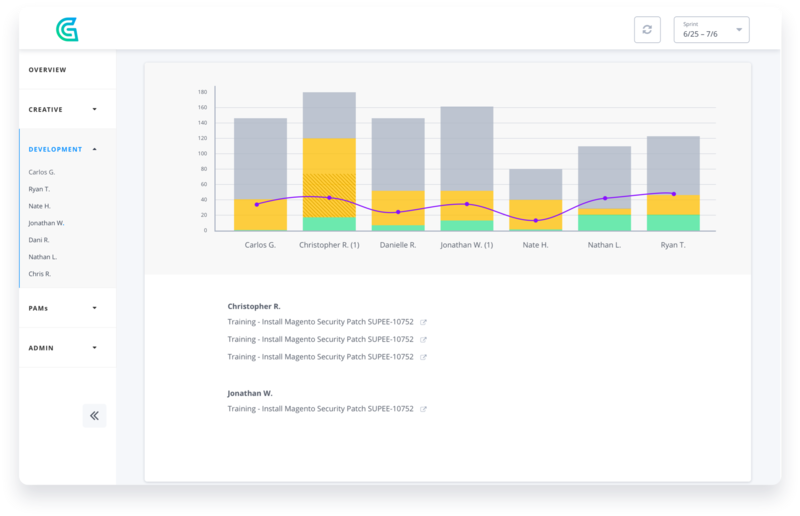 We designed the team dashboard to show where a team's energy is going and to give a side by side view of each team member. This way PMs and AMs can see how a whole team's workload is being distributed. Then they can make quick decisions about where to alot extra work or find team members who may be overwhelmed. This way teams work better, with more direction, and don't burn out as frequently.